Check out this amazing Firestorm-related cover by Ethan Van Sciver! This is the variant cover for Blackest Night #3 shipping in September, featured on IGN.com. In the foreground you’ve got a great shot of the Jason Rusch Firestorm. Normally Firestorm’s eyes are opaque white, but here is good usage of showing the iris. Very effective in communicating what is going on in Jason’s head. Next check out the hidden symbols in Firestorm’s flaming hair. You can see the symbols for the Red Lanterns, Orange Lanterns, the Sinestro Corps, Green Lanterns, Blue Lanterns, Indigo Tribe, and Star Sapphires. That is really cool! Then in the background you’ve got a really impressive shot of Black Lantern Firestorm! His mono-chromatic costume looks great. I love the design of this suit; it really honors the original costume (even with puffy sleeves!) and still conveys the Black Hand influence. 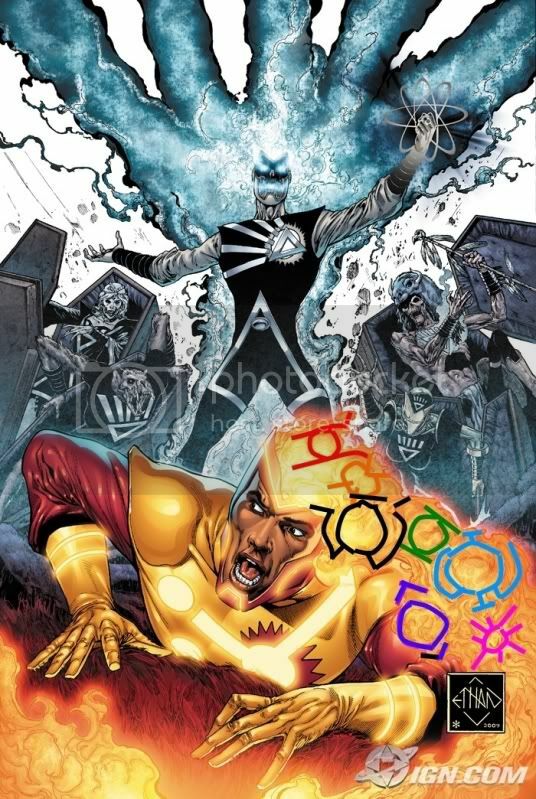 The energy coming off Black Lantern Firestorm shoots up in five different directions (like the Black Lantern symbol). 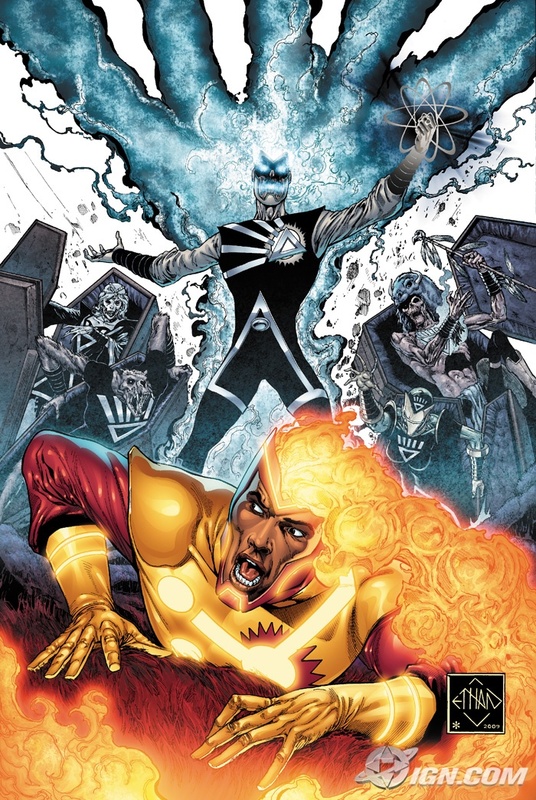 Most unexpected are the Firestorm villains as Black Lanterns climbing out of coffins. Killer Frost, Hyena (see update below), Black Bison, and the second Enforcer! That is so friggin’ cool! I’m obviously a real sucker for these minor characters, and I’m thrilled they are getting such exposure. Only one small gripe… Hyena in a short sleeve shirt doesn’t really work for me. Maybe it’s just me. Retailers please note: This issue will ship with three covers. For every 25 copies of the Standard Edition (with a cover by Ivan Reis & Oclair Albert), retailers may order one copy of the Variant Edition (with a cover by Ethan Van Sciver). For every 100 copies of the Standard Edition, retailers may order one copy of the Sketch Variant Edition (with a cover by Ivan Reis). Please see the Previews Order Form for more information. Wow. Just, wow. I’m so excited for this series!!! I really hope Jason gets a chance to shine, and that he comes out of the series still active as Firestorm in some way (merged with Ronnie, the Professor, or by himself). My thanks to Michael Bailey (VIEWS FROM THE LONGBOX podcast and the FORTRESS OF BAILEYTUDE blog) and Doug (the DOOM PATROL blog) for pointing me towards this cover. Thanks guys! UPDATES: That is not Hyena, it is Weasel. This was confirmed by Ethan Van Sciver over at Geoff John’s Message Board. That explains the shirt. Someone else pointed out that this cover is reminiscent of an older Firestorm cover. There are definitely some parallels between this cover and the cover to Firestorm (volume III) #10. Click here to see that cover. Someone put together a handy guide to finding the Lantern symbols in the Jason Rusch Firestorm’s flaming hair. Click here to see that visual guide. Posted in: Blackest Night, Comic books, Ethan Van Sciver, Firestorm #07: Jason post-Infinite Crisis, Killer Frost, Ronnie Raymond. Should I add 25 copies of this title to you hold list, so you can get the variant free? Sorry, Your Hold List. Got so excited over these covers, just couldn’t think correctly. This series is going to be insane! That cover is bananas! BANANAS I SAY! That is pretty darn cool. Nice to see that they’re paying homage to Flameheads history. I always thought that Black Bison and Killer Frost were two great underrated villains that could have been better used over the years. It would have been cool to see someone like Tokamok on there too. That was a guy they kicked off way too quickly!